The Archdiocese of San Francisco issued a statement today using some cryptic language about a priest named John Wadeson no longer being allowed to "undertake any ministry," due to "concerns in the community." After a quick Google search and call to the local head of Survivors Network of those Abused by Priests (SNAP), SFist learned that Wadeson is a twice-accused child molester who was kicked out of the Archdiocese of Los Angeles in 2003. It turns out, after two "credible" allegations of child abuse in L.A., Wadeson took off to the Archdiocese of Agana in Guam, where he worked until recently. 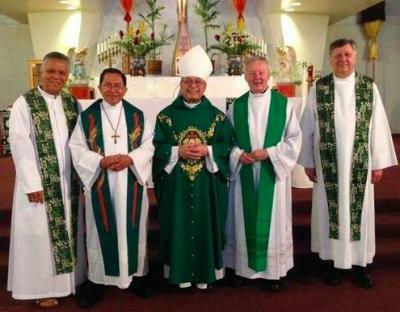 The Guam archdiocese suspended Wadeson from ministry on July 21, 2014, at which time he was already in San Francisco. In the statement, the Archdiocese of San Francisco claims Wadeson arrived with "assurances of good standing from his home diocese" in Guam. But according to SNAP's Tim Lennon, Wadeson served as a guest priest under the auspices of the Archdiocese of San Francisco (see documentation here), and returned to the Bay Area to minister at least twice: In 2011, at Saint Charles Borromeo Parish (3250 18th Street), where he "danced with kids and teenagers"; and in 2008, in the city of San Carlos. Lennon says Wadeson has a home in the Excelsior District. "Both Archdiocese in San Francisco and Guam knew he was kicked out of L.A., but they allowed him to minister," Lennon says, adding: "The San Francisco Archdiocese has accepted at least eight other priests that have credible allegations of abuse over the last five years. That practice has to stop." The Archdiocese of San Francisco has not returned SFist's request for comment, but its Victim's Assistance Coordinator, Dr. Renee Duffey, says she has not yet received any complaints about Wadeson. The Archdiocese of San Francisco asks anyone with information concerning Wadeson's conduct to call (415) 614-5506. And while we have you, check out how San Francisco's Archbishop likes to spend his time: Anti-gay marriage rallies and boozing.